Research into laying hen housing by the Coalition for Sustainable Egg Supply has shown a variety of pluses and minuses between three different systems – cage-free aviary housing, enriched colony housing and conventional cage. 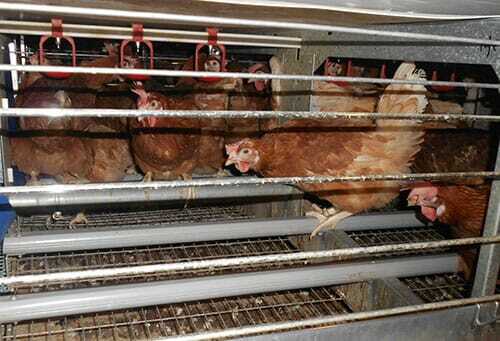 Hens in conventional cage system. The coalition is a multi-stakeholder group in the US including leading animal welfare scientists, academic institutions, non-government organisations, egg suppliers, and restaurant/food service and food retail companies. Some of the major producers, processors and retailers including Cargill, Tyson, Sysco and McDonald’s take part in the coalition that has evaluated various laying hen housing systems and potential impacts on food safety, the environment, hen health and well-being, worker health and safety and food affordability. The Laying Hen Housing Research Project is designed to provide those in the industry with science-based information on sustainability factors to guide informed production and purchasing decisions. The goal of this commercial-scale study of housing alternatives for egg-laying hens in North America was to understand the sustainability impacts of three laying hen housing systems – cage-free aviary, enriched colony and conventional cage. This research represents a snapshot in time – it assesses elements of hen housing and egg production using a single hen breed/strain, in a particular region of the US, over the course of three years and two flocks, in these particular housing systems. The coalition said that while it highlights the trade-offs involved and can assist in supporting informed decision-making, caution needs to be exercised in applying the research results to other scenarios with different variables. The research showed that egg production in the first half of the flock cycles for each system was fairly similar, with production from the aviary housed hens declining most through the remainder of the cycle. Average hen day production in the conventional cages was 3.5 to 4.8 per cent less than the enriched colony, while the aviary was 4.3 to 6.7 per cent less than the enriched colony system for the two flocks, the coalition report shows. The study found that hen mortality was much higher in the aviary system probably because of a variety of conditions, including hypocalcemia, egg yolk peritonitis, and behavioural issues, with hens either being excessively pecked, or picked out. There was less mortality in the enriched colony due to behavioural issues, and the least in the conventional system. There was the most egg yolk peritonitis in the conventional cages, less in the aviary and the least in the enriched colony. It was also harder to detect dead birds in the aviary and enriched colonies than in conventional cages. The research findings found that pullets reared in the aviary had better skeletal integrity than those reared in the conventional system. Hens in the aviary and enriched colonies had a higher incidence of keel bone deviations and/or fractures than hens in the conventional cage system, the study reports. 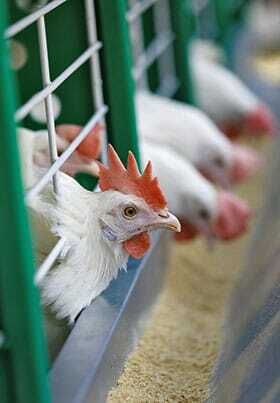 However, it says that hens in conventional cages had the highest incidence of foot problems, mainly hyperkeratosis. When hens in the aviary did have foot problems, they were more severe than those in the conventional cages or enriched colonies. Hens in the conventional cages and enriched colonies had cleaner feathers but worse feather cover than those in the aviary. 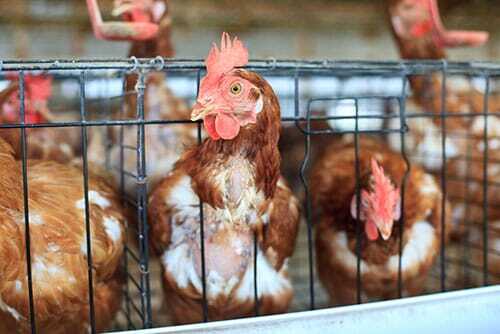 The patterns of feather loss suggested that hens in conventional cages and enriched colonies lost feathers due mainly to abrasion against the cage, while those in aviary lost feathers due to aggressive pecking from other birds. Hens with large areas of feather loss would be expected to lose more body heat than better-feathered hens. 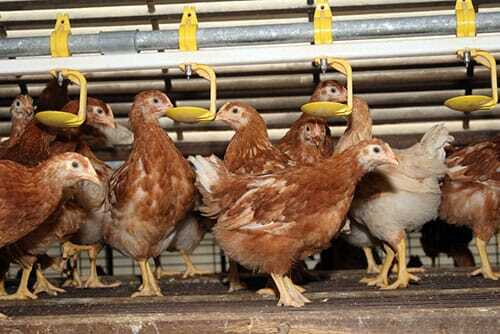 Hens use perches in enriched colony housing systems. All of the resources (perches, scratch pad, nests) in the enriched colony were used, but the perches and nests were overall better-used than the scratch pad, the coalition study says. There was consistent low use of the perches during the day and high use at night. Use of the scratch pad for foraging and dust bathing was low, but hens did sit, stand and sleep on the pad. Use of the nest was high, with approximately 97 per cent of eggs laid there. Nest pads stayed clean. However, eggs that were not laid in the nest were usually laid on the scratch pad, which became covered with manure over time. Resources in the aviary were also well-used. Nest use was recorded in Flock 2 when hens were 19-36 weeks of age, and hens were found to lay their eggs in the nest approximately 97 per cent of the time. At other times, however, the report says that there were periodic problems with eggs laid outside of nests, either on the floor in the litter or in other areas of the tiered enclosure. As in the enriched colony, the nest pads stayed clean. Hens used the internal perches extensively during the night, and particularly the perches in the top level. Hens used the open litter area to dust bathe most often in either afternoon or late morning. Hens were typically spread fairly evenly across the litter area, but were also seen to cluster there in large groups, with these ‘piles’ sometimes including as many as 229 hens and lasting for as long as six hours. Analysis of hen flight and landing success in the open litter area showed that failed landings were observed for 9.1-21 per cent of flights, which could have contributed to the higher rates of keel breakage seen during the necropsies of aviary hens, since most failed landings were due to collisions with other hens. The report says that pullets were in good physical condition when they were placed regardless of whether they had been reared in an aviary or conventional pullet rearing system. Those reared in the aviary did have more keel abnormalities and dirtier feathers than conventionally-reared pullets, but also better foot condition as shown by less toe damage and shorter claws. For hens evaluated at 52 and 72 weeks of age, the conventional cage and aviary systems each had positive and negative effects on hen physical condition (e.g., a greater incidence of foot problems in conventional cages but foot problems most severe in the aviary; dirtier feathers in the aviary but largest amount of feather loss in conventional cages; highest incidence of keel abnormality in the aviary), with enriched colonies generally intermediate. The tibiae and humeri of aviary-reared pullets had better load-bearing capacity and were stiffer than those of conventionally-reared pullets, indicating better bone quality and less susceptibility to bone breakage. This better bone quality was maintained in aviary hens up to 72 weeks. Bone quality of the tibiae and humeri was generally better in enriched colonies than in conventional cages at 72 weeks, although not as good as in the aviary. The main causes of mortality in all housing systems were hypocalcemia (low blood calcium levels) and egg yolk peritonitis (due to leakage of egg yolk into the abdominal cavity). Hypocalcemia was greatest in the aviary, with more than 3 times more hens affected in the aviary than in conventional cages and enriched colonies. Egg yolk peritonitis was greatest in the conventional cage house in Flock 1 while the aviary and enriched colony houses had equal numbers. For Flock 2, the conventional cage house and aviary house had equal numbers of egg yolk peritonitis while the enriched colony house had fewer birds with this condition. The aviary had the most hens that died from being caught in the structure, had been vent cannibalised or excessively pecked, or that were emaciated in both flocks, while the conventional cage and enriched colony house were relatively equal in those categories.